"There! Can you hear it Superman? So small and far away. That's the sound of you failing everyone you promised to save!" As an unabashed Grant Morrison fan I will state now that I read and really enjoyed FINAL CRISIS, although like many other people, it seems, I can't quite bring myself to proclaim it a true masterpiece. A slightly flawed masterpiece, I think, would be a fair verdict. There are brave and bold ideas aplenty in the creative writing we've come to expect from Morrison and heroism on a truly meta-epic scale and yet, and yet, something just holds it back from being perfect. 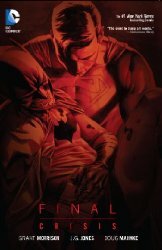 I'm quite sure people will still be picking up FINAL CRISIS in years to come unlike some of the many previous CRISIS variants, but whether it will ultimately acquire the status of works like KINGDOM COME and THE DARK KNIGHT RETURNS remains to be seen. So why should you read FINAL CRISIS? Quite simply because it's Morrison writing superheroes in his own unique way that stretches and probes your mind and posits questions about your understanding of our own universe, and of course ultimately entertains as well. Let us make no mistake, FINAL CRISIS is never ever dull, nor is a single panel wasted with pointless fight sequences, instead it is plot, plot, PLOT and BIG ideas with many, many stand-out moments of brilliance, including some poignant ones. This is superheroes for intelligent adults with something to say, and thoughts to provoke. *I'm not even going to attempt a plot summary or we'd break the record for the longest review ever, I think.